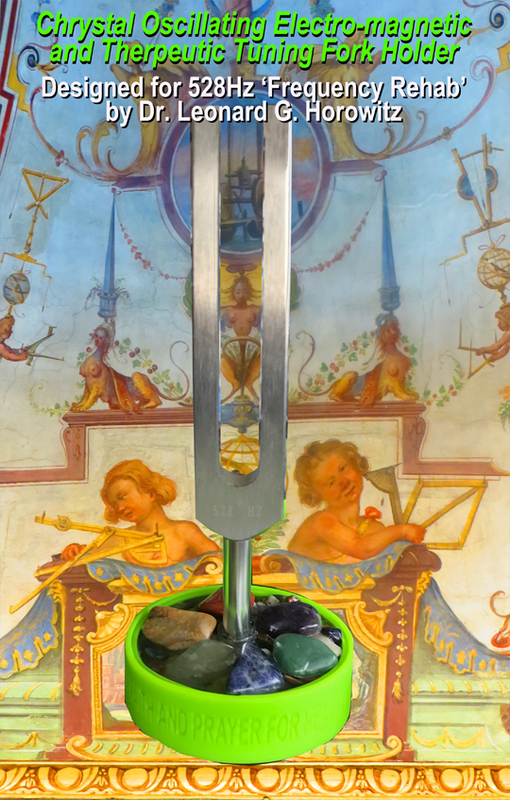 This crystal oscillating 528hz frequency resonating electro-magnetized tuning fork holder (without the fork that is sold elsewhere on this site, or in a special combination option) is more than a 'conversation piece' and beautiful clinic addition for energy medicine practitioners. This is 'therapeutic 'functional art' developed by a world leading pioneer in bio-energy self-help technologies. We're talking about the unparalleled natural care-giver and professional trainer, Dr. Leonard G. Horowitz. Dr. Horowitz teaches a 'Frequency Rehab' Course wherein he details how you can manufacture such crystal oscillators, if you are so inclined. Otherwise, you can just purchase one and enjoy using it right away! Dr. Horowitz designed this '528hz Crystal Oscillator and Orgone Generator' to output non-Hertzian (scalar) energy, treat common aches and pains, and functionally hold a tuning fork. This crystalline frequency resonator is the size of a hockey puck. It has a strong magnet and copper coil inside a 528Hz (cymatically-crystallized) matrix that holds and transmits this "MIracle Frequency of pure LOVE--"The Universal Healer." This combination is used to remedy pain and inflammatory conditions. Put negatively-charged (alkalizing) electrons into the acidified area by laying the therapeutic puck on the painful spot. This sedates the condition and works amazingly well. The crystallized oscillator and tuning fork holder can be used with most brands of tuning forks. This combo serves as a universal healing and environmental clearing instrument when the tuning fork is struck and placed back into the holder; or simply 'pinched' to start the fork vibrating in the holder. The outer green rubber collar around the 528hz crystallized magnetized generator is perfect for striking your tuning fork without marring the metal. So this rubber protects the sound quality of each fork. Shown in the image above is a 528hz fork in the 'Delux Holder." The "Standard Holder" does not have the hand-selected gemstones raised on the top surface as shown. The Delux Holder have been more popular, and have been sold out on several occasions. Only limited quantities are available because they are handmade and artfully designed. The non-Hertzian (scalar) waves that broadcast from this instrument is complemented by the magnetic energy field generated by the 13K Gauss internal magnet. This 'biofield' is amplified by the Tesla-like copper coil in the 528Hz frequency-cured (cymatically-hardened) matrix. Add to this wonderful design lots of beautiful natural gemstones and healing crystals placed throughout this therapeutic creation. Lay caregivers and licensed professionals can place the crystal oscillator on people, or themselves, for healing. This is actually a 'must have' for body workers, including massage therapists and physical therapists--a great tool for all healing practitioners. Matrix memory of the 528Hz frequency. This is the "MIracle" note for making miracles, because this is the MIRACLE TONE in the ancient Solfeggio scale. (Read Dr. Horowitz's Book of 528: Prosperity Key of LOVE.) This is also the "Key of the House of David." (Isaiah 22:22; Rev. 3:6-8). It is also widely known to repair damaged DNA. Recent double-blind peer reviewed studies found this frequency boosted natural immunity 100% through anti-oxidant activity, and caused a 20% improvement in central nervous system protection, especially recommended for alcoholics who are damaging their nerve cells (according to the study). The rubber collar is colored 528nm. The striking ring is inscribed with the reminder (or instruction): "LOVE 528 • USE WITH FAITH & PRAYER FOR HEALING." "Instead of a bath, make it a baptism! Use your 528 tuning fork and holder to bless bath water vibrationally. Use this resonance energy of "LOVE 528" frequency in God's heart too, as reported by Dr. Horowitz. Strike the tuning fork on the rubber ring around the crystal oscillator; then submerge the stem of the fork only with your hand to sink the handle of the 528-tuning fork into the Water. Let it vibrate, and play out completely. Water will not harm the oscillator/holder. Try repeating this six times, with prayer. Your bath will feel much more relaxing. "A group of sound healing researchers in Israel routinely travel with 528Hz tuning forks and these holders. They activate them whenever confronted by angry people. Also, they play the forks whenever they come upon others in conflict (which happens a lot in Israel these days). They claim this distracts, fascinates, humors, and calms those engaged in arguments. They strike the 528 fork, wave it through the air, and that seems to help settle disputes. Can you imagine what might happen if United Nations peace-keepers were to broadcast 528 pure tones around Gaza, Jerusalem and Palestine? What about other places of conflict? Note: Tuning fork is not included with this holder, and must be ordered separately. "Don't forget to pray with the 528 fork (faithfully). "Instead of a bath, make it a baptism! Use your 528 tuning fork and holder to bless bath water, vibrationally, with the sound of "LOVE 528" in God's heart, as reported by Dr. Horowitz. Strike the tuning fork on the rubber ring around the instrument; then submerge the stem only with your hand to sink the handle of the 528-tuning fork into the Water. Let it vibrate, and play out completely. Then repeat this a total of six times, with prayer. Your bath will feel much more relaxing. Click the button below to add the 528hz Crystal Generator Electromagnetized Tuning Fork Holder and Artful Therapeutic Instrument (tuning fork sold separately) to your wish list.